cargo being sent.” The Commission is currently reviewing com- ments as a result of an advanced notice of proposed rulemaking that could affect OTIs, with the ultimate goal of balancing the needs of consumers with those of the industry. Commission regulations, working with Bureau of Enforcement (BOE), which is the prosecutorial arm of the Commission. BOE attorneys also negotiate settlements and informal compro- mises of civil penalties, and may act as investigative offi ces in formal fact-fi nding investigations. During the fi rst 10 months of 2013, the FMC completed seven compromise agreements from companies that violated the Shipping Act. The recovery totaled of $617,500 in civil penalties. The alleged violations include providing service that was not in accordance with the rates or charges contained in their tariffs, failure to be properly bonded and falsifying cargo declarations related to service contracts. 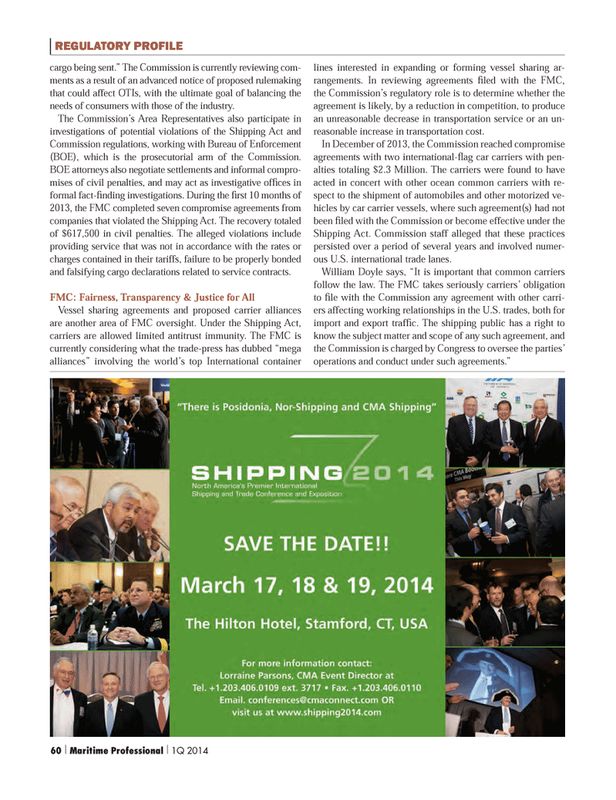 Vessel sharing agreements and proposed carrier alliances are another area of FMC oversight. Under the Shipping Act, carriers are allowed limited antitrust immunity. The FMC is currently considering what the trade-press has dubbed “mega alliances” involving the world’s top International container lines interested in expanding or forming vessel sharing ar- rangements. In reviewing agreements fi led with the FMC, the Commission’s regulatory role is to determine whether the agreement is likely, by a reduction in competition, to produce an unreasonable decrease in transportation service or an un- reasonable increase in transportation cost. Shipping Act. Commission staff alleged that these practices persisted over a period of several years and involved numer- ous U.S. international trade lanes.